"It was an astounding experience to discover the fear blocks, how they impacted me and stopped me moving forward." I help Conscious Creatives, Spiritual Seekers and Conscious Entrepreneurs to identify and heal the fear blocks that stop you creating a life you love, so you can take aligned, effortless, inspired, action! I do this by combining healing energy work, focused awareness, inner exploration, visioning, and my unique fear-block shifting technique. As a dynamic, intuitive being, I am definitely not afraid to challenge preconceived ideas or go to those uncomfortable places where transformation can take place! 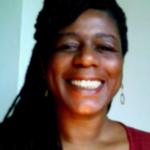 I am a passionate and transformational writer, speaker, spiritual life coach and creator of conscious music. Awakened Coaching, is the way I get to support you! "That was an amazing workshop! It left me feeling whole and grateful and full of giggling joy." As an initial thank you for connecting I'd like to offer you two free gifts! Yve has an B.A. in Development Economics, a diploma in print, radio and web, journalism. She is a powerful speaker, certified workshop facilitator and spiritual life coach. She's currently an editor and weekly columnist at The Good Men Project. She's also had articles published in New Spirit Journal, Sivana East and The Wellness Universe. She's highly creative and is an author, poet and talented singer/songwriter of conscious music too.